Listen to podcast. Find it on iTunes/iPod and Podcast.com. View a full transcript or download the transcript. Learn more. Sponsor: Hewlett Packard. 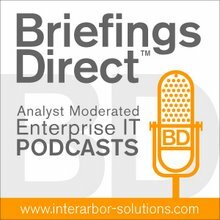 This latest BriefingsDirect podcast discussion tackles the high -- and often under-appreciated -- cost for many enterprises of doing nothing about aging, monolithic applications. Not making a choice about legacy mainframe and poorly utilized applications is, in effect, making a choice not to transform and modernize the applications and their supporting systems. Not doing anything about aging IT essentially embraces an ongoing cost structure that helps prevent new spending for efficiency-gaining IT innovations. It’s a choice to suspend applications on ossified platforms and to make their reuse and integration difficult, complex, and costly. Doing nothing is a choice that, especially in a recession, hurts companies in multiple ways -- because successful transformation is the lifeblood of near and long-term productivity improvements. Here to help us better understand the perils of continuing to do nothing about aging legacy and mainframe applications, we’re joined by four IT transformation experts from Hewlett-Packard (HP): Brad Hipps, product marketer for Application Lifecycle Management (ALM) and Applications Portfolio Software at HP; John Pickett from Enterprise Storage and Server marketing at HP; Paul Evans, worldwide marketing lead on Applications Transformation at HP, and Steve Woods, application transformation analyst and distinguished software engineer at HP Enterprise Services. The discussion is moderated by me, Dana Gardner, principal analyst at Interarbor Solutions. Evans: What we’re seeing is that the cost of legacy systems and the cost of supporting the mainframe hasn’t changed in 12 months. What has changed is the available cash that companies have to spend on IT, as, over time, that cash amount may have either been frozen or is being reduced. That puts even more pressure on the IT department and the CIO in how to spend that money, where to spend that money, and how to ensure alignment between what the business wants to do and where the technology needs to go. Our concern is that there is a cost of doing nothing. People eventually end up spending their whole IT budgets on maintenance and upgrades and virtually nothing on innovation. Woods: For years, the biggest hurdle was that most customers would say they didn’t really have to make a decision, because the [replacement] performance wasn’t there. The performance-reliability wasn't there. That is there now. There is really no excuse not to move because of performance-reliability issues. What's changing today is the ability to look at a legacy source code. We have the tools now to look at the code and visualize it in ways that are very compelling. What has also changed is the growth of architectural components, such as extract transform and load (ETL) tools, data integration tools, and reporting tools. When we look at a large body of, say, 10 million lines of COBOL and we find that three million lines of that code is doing reporting, or maybe two million is doing ETL work, we typically suggest they move that asymmetrically to a new platform that does not use handwritten code. That’s really risk aversion -- doing it very incrementally with low intrusion, and that’s also where the best return on investment (ROI) is. ... These tools have matured so that we have the performance and we also have the tools to help them understand their legacy systems today. Hipps: This term "agility" gets used so often that people tend to forget what it means. The reality of today’s modern organization -- and this is contrasted even from 5, certainly 10 years ago -- is that when we look at applications, they are everywhere. There has been an application explosion. When we start talking about application transformation and we assign that trend to agility, what we’re acknowledging is that for the business to make any change today in the way it does business -- in any new market initiative, in any competitive threat it wants to respond to, there is going to be an application -- very likely "applications" plural. The decisions that you're going to make to transform your applications should all be pointed at and informed by shrinking the amount of time that takes you to turn around and realize some business initiative. That's what we’re seeking with agility. Following pretty closely behind that, you can begin to see why there is a promise in cloud. It saves me a lot of infrastructural headaches. It’s supposed to obviate a lot of the challenges that I have around just standing up the application and getting it ready, let alone having to build the application itself. So I think that is the view of transformation in terms of agility and why we’re seeing things like cloud. These other things really start to point the direction to greater agility. ... I tend to think that in application transformation in most ways they’re breaking up and distributing that which was previously self-contained and closed. Evans: ... Once we have done it, once we have removed that handwritten code, that code that is too big for what it needs to be in terms to get the job done. Once we have done it once, it’s out and it’s finished with and then we can start looking at economics that are totally different going forward, where we can actually flip this ratio.